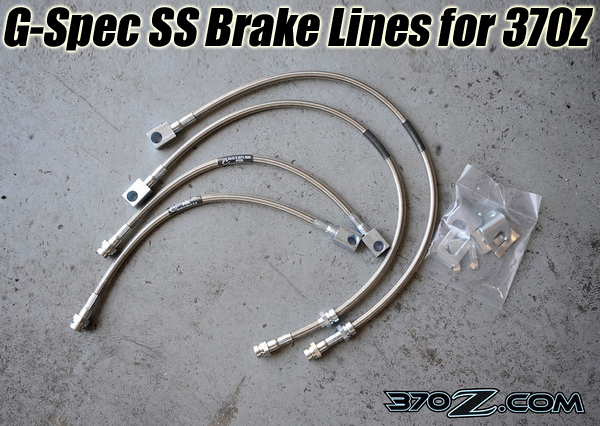 G-Spec Braided Steel Lines for the 370Z Rock! We recently evaluated a set of G-Spec lines for the Nissan 370Z. The G-Spec lines also fit the Infiniti G37 Sedan and Coupe. We installed them on the Killer B which is starting to become our official 370Z Project demonstrator vehicle. The Killer Bee is a Sport Package 370Z with the standard factory big brakes. Although the Sport Package 370Z has exceptional brakes, some improvement can usually be found by installing braided steel lines. This is because stiff braided steel lines do not expand with pressure like the stock rubber lines. Brakes, especially ABS brakes can see up to 1200 psi of hydraulic pressure in the lines. 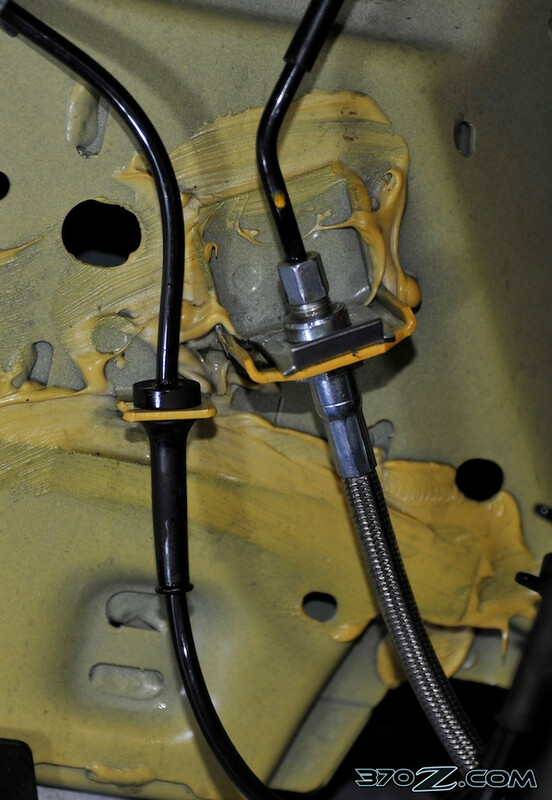 This pressure causes the stock rubber lines to swell causing a soft pedal. This gives the driver less accurate feedback making the brakes harder to modulate. Stiff braided lines give much better feel as every bit of pedal travel from the drivers foot is hydraulically applied to the brake calipers to move the pistons instead of swelling a rubber line. Usually ABS systems function better with braided lines as well, cycling faster with greater resolution. Howard Watanabe of Technosquare installed G-Spec’s braided steel line kit on our 370Z. The G-Spec lines are very high quality. Typically braided steel brake lines are industrial or aircraft hydraulic flex lines adapted to automotive use. These lines are typically composed of a Teflon inner layer surrounded with a braided steel jacket. Some higher quality lines also have an anti-abrasion sleeve as braided steel is quite abrasive and can saw though parts of the car in extended use! G-Spec goes a step extra to produce what we think is one of the highest quality lines currently on the market. G-Spec uses a Teflon liner surrounded with a Kevlar wrap. The Kevlar fights expansion to a greater degree than the steel braid, having a tensile strength 6 times higher than steel pound for pound. 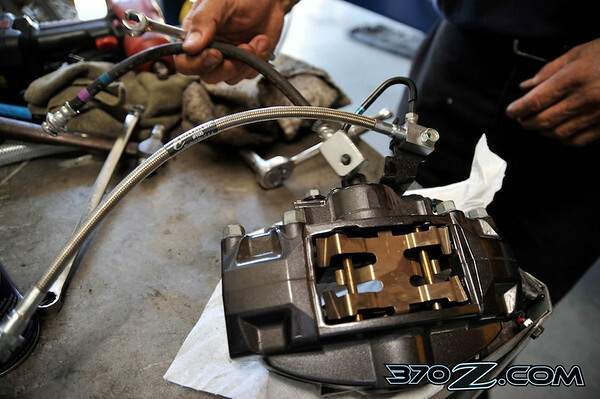 No other braided steel brake line to our knowledge has this feature. There an anti abrasion sleeve fitted over the Kevlar to protect it from the steel braid, then a layer of braided stainless steel is placed over that. Finally a clear protective layer is placed over the steel, mostly to protect parts of the car from the potentially abrasive braided steel. Brake pedal feel is firm and constant. Quite a difference over stock actually that one might overlook because perhaps they will feel it is an uneccissary upgrade but one that will improve performance and driver feedback when it comes to braking. Personally this should be among one of the first steps when looking to modify a vehicle in my opinion.